Sorry I have been neglecting my blog lately but I've been really busy and haven't had time to take pictures for the blog. 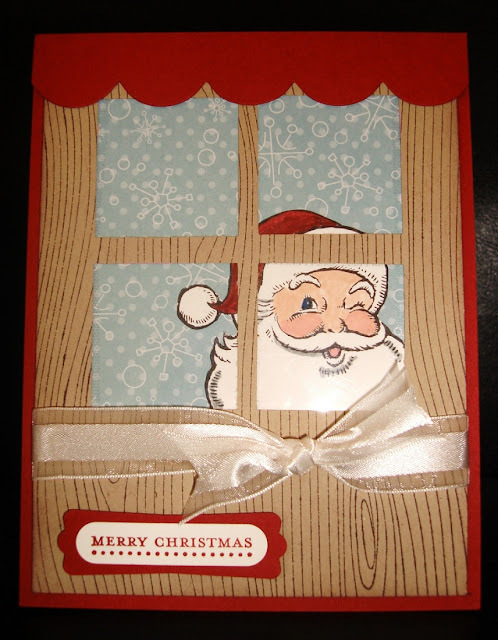 Today, I want to show you a card I am making with my club members this coming month. I already made it with my Stamp Club members yesterday and they really liked it. It was fun to make. I love love love this Santa from the Jolly Old Saint Nick Stamp set. I got the idea of the card from Becky Roberts (a fellow Stampin' Up Demonstrator) and just changed it up a little bit with the paper and ribbon and I used the Tasteful Trim Bigz XL Die for the Big Shot to put on top of the card. I also used the Teeny Tiny Wishes for the sentiment. I will post the 3D item tomorrow so watch out for it! Have a great day! Your card is adorable. I love this Santa too. Just adorable! Following you via Stampin Connection #271! Wow, I love this card. How did you get the window panes to line up so nicely? I've got to try this.